Earlier today if you headed into Google Maps and look for the city of Rawlpindi in Pakistan you'd have found a rather strange image. 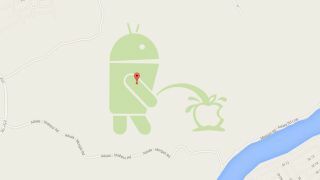 Just to the south of the city stood the iconic Android robot logo peeing on its main competitor, the Apple logo. Though it's located in a base terrain area, which the public shouldn't be able to edit, Google said in a statement (see below) that the addition was "user-created content." If you headed east for a couple of miles you'd also have found an image that stated "Google review policy is crap" with a sad face to the side. Now the internet is ablaze with those hunting for more hidden messages from the hacker but so far nothing else has been found. The images you see here have been removed. Update: Google said soz for the images in a statement sent to the Washington Post, and indicated a user created them, not an employee. "We're sorry for this inappropriate user-created content; we're working to remove it quickly," Google's Mara Harris wrote in an email to the publication. "We also learn from these issues, and we're constantly improving how we detect, prevent and handle bad edits." This case seems to be an outlier as Harris wrote most users editing Google Maps come up with "great contributions." Some would argue this is pretty great in its own right. Check out Edward Snowden's new shop in the White House according to Google Maps.